Pamela Gossin has “found consilience between literature and science” at the same place, she says, where “Hardy found it—at the level of primary expression of lived history and thought” (p. 6). Like Hardy’s novels, Gossin’s book is a lived product, the expression of many convergences: of literature and science, of literary studies and the history of science, of critical methodologies and their eloquent applications, and of both opening and closing “gaps between the unknowable, possible, probable and certain” (p. 8)—the openings generally done, Gossin asserts, by literary scholars and the closings by historians of science. 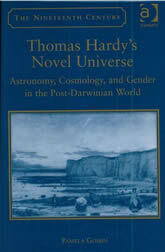 Thomas Hardy’s Novel Universe is not a major book on Hardy, nor is it a major contribution to history of science; however, it does offer a gracious, clear voice in the post–Science Wars era—not a voice for either/or, but one for both.